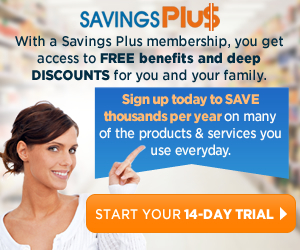 With a Savings Plus membership, you get access to free benefits and deep discounts for you and your family. Sign up today to save thousands per year on many of the products and services you use everyday. They offer members only discounts at over 300,000 merchants at up to 50% savings. Even save on veterinary services for your pet, pet stores, boarding, legal services and much more! To start your free 14-day trial to Savings Plus simply visit their website and click on the "Start 14-Day Trial" button. You'll only pay $1.95 for your trial. After 14 days, your membership will continue for $19.95/month until cancelled by you. Cancel anytime via their website or by phone.